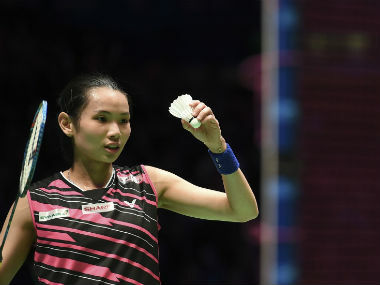 New Delhi: Commonwealth Games bronze medallists Ashwini Ponnappa and N Sikki Reddy notched up a stunning straight-game win over world no 18 Li Wenmei and Zheng Yu to make it to the second round of women's doubles competition at USD 350,000 India Open on Tuesday. 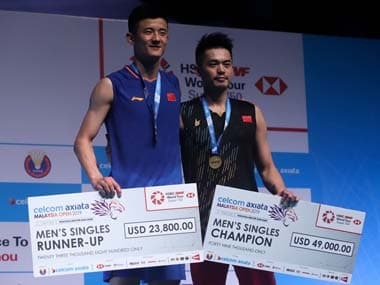 The world no 23 Indian pair, who had finished runners-up at the Syed Modi International World Tour Super 300 tournament, stunned Li and Zheng 22-20 21-19 in the opening round. "We got really good training last week. We had stretched top players but couldn't convert it to a win, so it gives us a lot of confidence to be able to do that," Ashwini said after the match. Men's doubles duo of Arjun MR and Shlok Ramachandran, however, suffered a 16-21 18-21 loss to Chinese pair of Huang Kaixiang and Wang Zekang to crash out of the World Tour Super 500 tournament. As many as 13 shuttlers were from India out of 16 in the men's singles qualifiers, where Rahul Yadav Chittaboina, Siddharath Thakur, Kartik Jindal and Kartikey Gulshan Kumar made it to the main draw. "I feel delighted qualifying for the main draw but need to recover from today's play for tomorrow's match against Khosit Phetpradab from Thailand," the 20-year-old Jindal said. In women's singles, Ritika Thaker, Prashi Joshi, Riya Mookerjee, and Vaidehi Choudhari progressed out of the eight qualifiers, which featured six Indians. While Thaker will face eighth seed Mia Blichfeldt, Joshi and Choudhari have tough opponents in the form of third seed He Bingjiao and seventh seed Han Yue respectively. Pranaav Jerry Chopra, one-half of India's mixed doubles pair of N Sikki Reddy, had an easy outing alongside Shivam Sharma in the men's doubles qualifying round where all eight pairs were Indians. 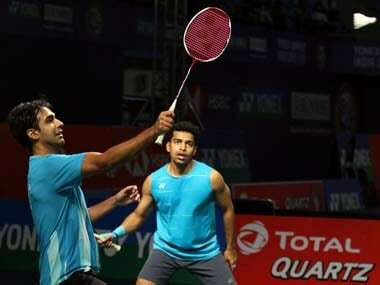 The duo needed just 19 minutes to prevail over Vikas Chauhan and Sandeep Choudhary 21-10, 21-5. In women's doubles, Megha Morchana Bora and Manali Sinha staved off a stiff resistance from Anamika Kashyap and Sanghamitra Saikia to register a 24-22, 21-13 win. 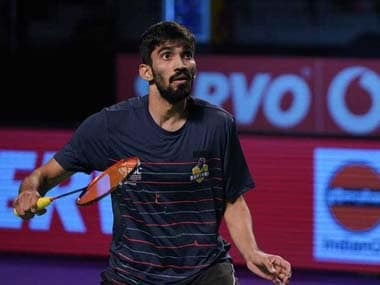 On Wednesday, 2017 champion PV Sindhu will start her campaign against compatriot Mugdha Agrey, while 2015 winner Kidambi Srikanth meets the tricky Wong Wing Ki Vincent in the opening round and fifth seed Sameer Verma has Rasmus Gemke of Denmark as his first-round opponent. Rahul Yadav Chittaboina (IND) bt Anant Shivam Jindal (IND) 21-14, 21-15; Siddharath Thakur (IND) bt Gurpratap Singh Dhaliwal (IND) 21-6, 21-13; Kartik Jindal (IND) bt Sarath Dunna (IND) 21-12, 21-23, 21-19; Pranaav Jerry Chopra (IND)/Shivam Sharma (IND) bt Vikas Chauhan (IND)/Sandeep Chaudhary (IND) 21-10, 21-5; Megha Morchana Bora (IND) /Manali Sinha (IND) bt Anamika Kashyap (IND)/Sanghamitra Saikia (IND) 24-22, 21-13.